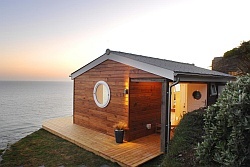 Looking out the window or sitting on the deck of this tiny cabin, you could easily feel like you’re in a treehouse! Built on stilts over a steep slope, Owl Tree Cabin is elevated into the canopy of the surrounding redwood forest. The interior also has a treehouse aesthetic with exposed framing lumber, handbuilt stairs and kitchen, and natural finishes on the wood. 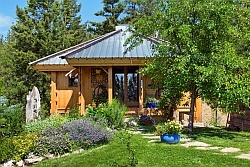 Owl Tree Cabin has 225 ft2 (20.92) on the main level plus a bedroom loft. It was built by its owners, who made good use of the small space to craft a perfect hideaway for one or two. 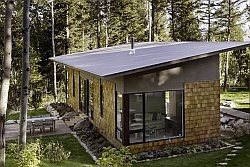 The cabin is just a few miles inland from the coast of Northern California, not far from Mendocino. 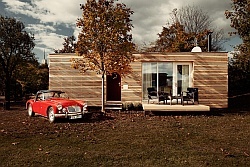 With a compact kitchen, bathroom, running hot water and even internet, we could easily live there full time. 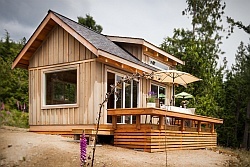 The cabin doesn’t seem to be insulated, but with the woodstove and coastal California’s mild climate, insulation might be more of a luxury than a necessity. The bedroom loft is over the deck and bathroom, allowing the main room to have a vaulted ceiling. The loft is easily high enough to stand in the central area and there is enough room for a small desk beside the bed. The loft is reached by a steep cottage-style stair, not as steep as a ladder but it might still be easier and safer to descend backwards (facing the stairs). The bathroom is complete with a shower and what appears to be a composting toilet. You do have to take a couple steps outside to reach it though, as the bathroom door opens off the deck. Unlike the main room, the bathroom is painted white to keep it bright. Owl Tree Cabin can be rented through Airbnb. Enjoy the weekend! Photographs courtesy of Airbnb / Owl Tree Cabin. I love this cabin. 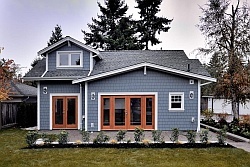 Are houseplans available for purchase?